After breakfast drive to Agra. Arrive Agra and check-in at hotel. Later visit the world famous Taj Mahal, Built by the Mughal Emperor Shahjehan in 1630 for his queen Mumtaz Mahal to enshrine her mortal remains. Also visit Agra Fort, containing the pearl mosque – the rusty and majestic red sandstone fort of Agra stands on the bank of river Yamuna and Emperor Akbar started the construction in 1566. At the Diwan-I-Khas (Hall of Private Audience) where marble pavilions with floral inlays lend on ethereal ambience, the Emperor sat on his gem-studded peacock throne and met foreign ambassador and rulers of friendly kingdoms. Night stay in Agra. HAWA MAHAL - The ornamental facade of this "Palace of Winds" is a prominent landmark in Jaipur. Their five-storey structures of sandstone plastered pink encrusted with fine trelliswork and elaborate balconies. The palace has 953 niches and windows. Built in 1799 by Pratap Singh, the Mahal was a royal grandstand for the palace women. Overnight stay in Jaipur. After breakfast drive to Delhi. Arrive Delhi and transfer to the hotel. Later proceed for city sightseeing tour of Delhi visiting Old & New Delhi. Morning drop at railway station to board the train for Amritsar. 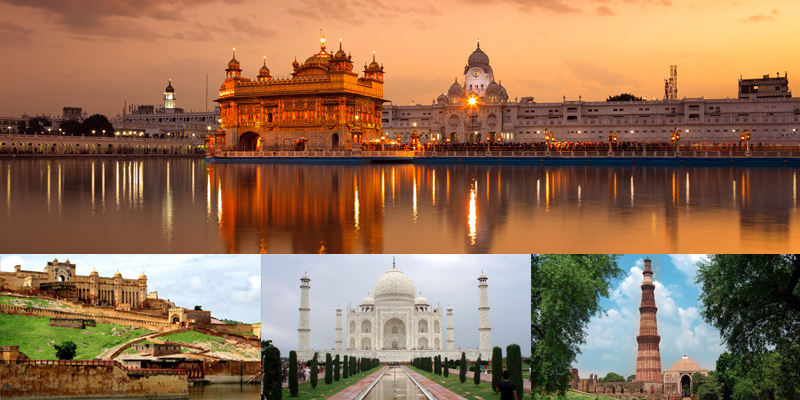 Arrive Amritsar, pick-up from railway station and transfer to the hotel. Rest of the day at leisure. Night stay in Amritsar. After breakfast visit Golden Temple, Historic Jallianwala Bagh and the beautiful Ram Bagh Gardens. Evening excursion trip to Wagah Border, at the India – Pakistan border, to witness the change of guard ceremony. Soldiers of both countries participate in an interesting ceremony at the end of which they shake hands. Night stay in Amritsar. After breakfast drop at railway station to board the train for Delhi. Arrive Delhi, pick-up from railway station and departure transfer to the airport to board the flight for onward journey. Tour ends with sweet memories.